Awesome deals and discounts in the Dallas/Ft. Worth area! Interested in advertising on our site? For as little $75 per month, DFW Living on the Cheap will post your display ad and link it to the website of your choice. Reach people throughout the United States who are looking for deals, discounts and overall good value. Our readers are savvy shoppers who appreciate getting more for their money. ♦ 300px by 250px = $150/month. ♦ 160px by 600px = $150/month. ♦ 160px by 280px = $75/month. Discounts are available for six-month terms, as well as one-year contracts. We also contract for sponsored and custom content. IMPORTANT!! We require a JPG or PNG of the ad. Please include a border if the background is white. If you need assistance in creating your ad or converting it to a JPG or PNG, please contact us at ads@dfwlivingonthecheap.com for details, specifications or recommendations for graphic design artists. Please note: DFW Living on the Cheap reserves the right to refuse publication of any ad it deems inappropriate for the site. Enter your email address below to receive updates whenever DFW Living on the Cheap shares new content. DFW Living on the Cheap is a member of Living on the Cheap, a network of websites published by frugalistas, journalists and consumer advocates. 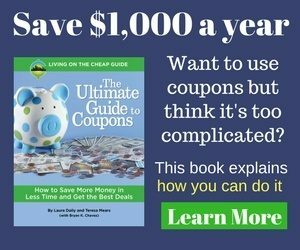 Find practical advice on saving money on groceries, travel and shopping, plus tips from our experts on how to live the good life for less at Living on the Cheap. © 2019 DFW Living on the Cheap. Site design by Five J's Design. Never miss a deal in Dallas/Fort Worth! Make your other emails jealous by signing up for our FREE e-newsletter! Freebies, deals and discount codes are just a click away!